UPDATE: If you can’t wait for another week and you want to see Pikachu’s One Lucky Day unboxing, then Funko has you covered. Following both announcements this morning, a livestream featuring both the Bulbasaur Pop and A Day with Pikachu figure unboxings was shared. In addition to Luck Incense, an Amulet Coin is also featured on the figure — tucked away behind Pikachu. Sure, those two items’ benefits don’t stack together in the digital world, but that can be ignored here! Right after this morning’s announcement of Bulbasaur joining the Funko Pop Pokémon line, The Pokémon Company followed up with another piece of merch news. Not only will we see more characters joining the Pop family soon, we’ll also be receiving a spinoff series featuring Pikachu. A Day with Pikachu celebrates the franchise’s iconic electric mouse by capturing his likeness through a vinyl figurine. Currently, the toy line will run for 12 months. Starting on February 13th and only available at PokémonCenter.com, the first entry will be introduced to the world. 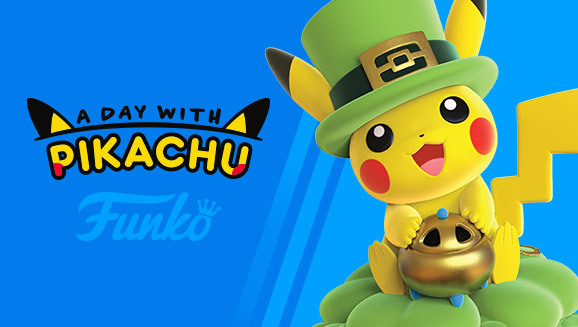 Titled “A Day with Pikachu: One Lucky Day,” the Pika is extremely eager to celebrate St. Patrick’s Day and crack open that Luck Incense! Torn between which series to collect? Totally understandable! Stay tuned, as we’ll keep watching Funko and the Pokémon Center for future release information! Well, my kid would have loved this but it sold out almost instantly. (Though there are still giant “featured” images on their website.) So frustrating.